Integrity is consistently part of our behaviours and actions. We are ethical, authentic and transparent in everything we do. We are open and honest in the way we engage with people. We are focused and deliver with conviction on our promises. We are accountable and responsible throughout the whole delivery process. We are committed to delivering a sustainable future by doing the right things, right. We aim to deliver beyond our potential by making solid decisions based on calculated risks. By leaving our circle of habits, learning from our mistakes and experiences, we can continually contribute value to our partners, communities and our company. We are one team. 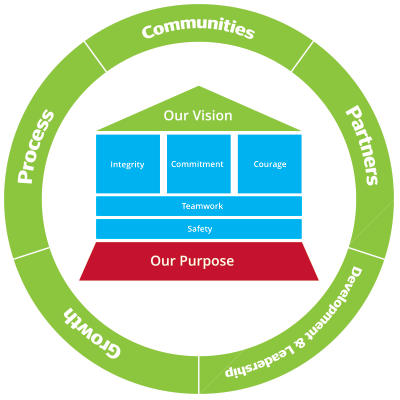 We use the diverse abilities and experiences of our people to deliver our core purpose. We value a working environment that encourages knowledge sharing, open communication, feedback, collaboration, best practices, respect, fun, while also recognising results. The health and safety of our employees and company guests is paramount, and should never be compromised. To consistently offer a large range of air distribution systems and products, that would help improve the indoor comfort and air quality of our communities. To use best practices; be lean and process orientated to achieve company efficiency and operational effectiveness. To maximise our long term financial returns, thereby securing the future of our employees, stakeholders and partners.